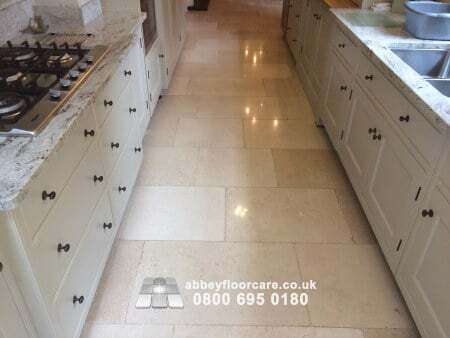 This marble polishing Stockton Brook project arose after a client had called on our marble restoration services. 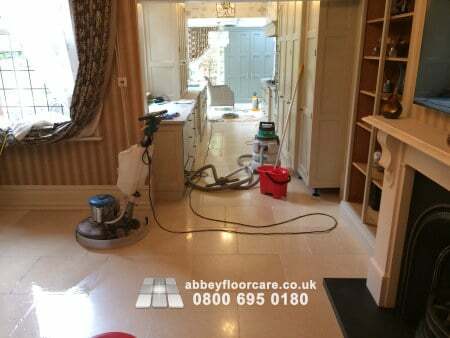 He wanted to repair damage on marble tiles caused by aggressive scrubbing with a plastic brush. Our client had used the brush to clean the grout lines, but the cleaning dulled the edges of the tiles. This image shows how the edges of the tiles next to the grout have been dulled by the grout cleaning brush. This plastic bristled brush had been used. A flat bristle brush is not the right brush for grout cleaning. The brush head is wider than the grout lines and so it will rub against the surface of the marble tiles. 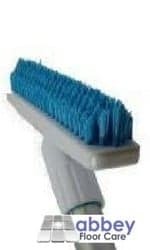 A grout cleaning brush should have a very narrow set of bristles or the bristles should be shaped to a point. This means that only the point of the brush can get into the grout without rubbing the surface of the marble tiles. It is surprising the amount of pressure can be exerted over a small area using a small grout brush. 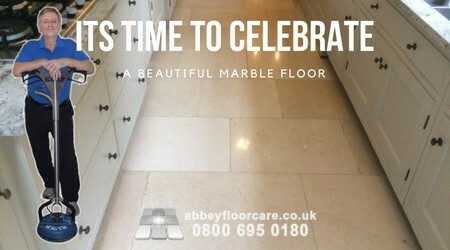 So it is not difficult to mark marble with such a brush. I started the project by cleaning the grout using a rotary floor scrubbing machine with a soft bristled brush and my marble grout cleaner. 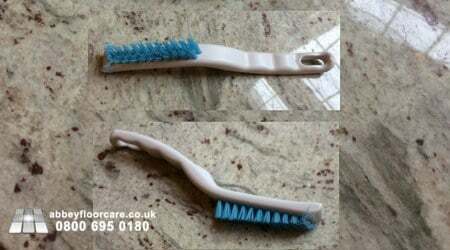 The soft bristles rub the marble grout cleaner into the grout and remove the surface soil. I then rinsed the floor to remove the emulsified slurry. I used marble polishing powder to re-polish the damage caused by the aggressive grout cleaning, and the rest of the marble tiles. Finally, I sealed the marble and the clean grout with three coats of high-quality marble impregnating sealer. My client was really happy with my work. 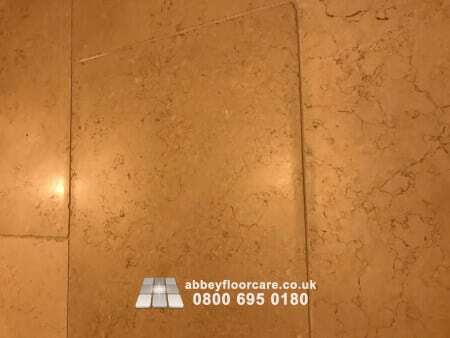 If you have a dull or damaged marble floor, please contact me for a free no-obligation quotation to restore your marble to a beautiful finish.